Overland tour in Madagascar from Morondava to Fort Dauphin between baobab and lemurs. Madagascar pictures. 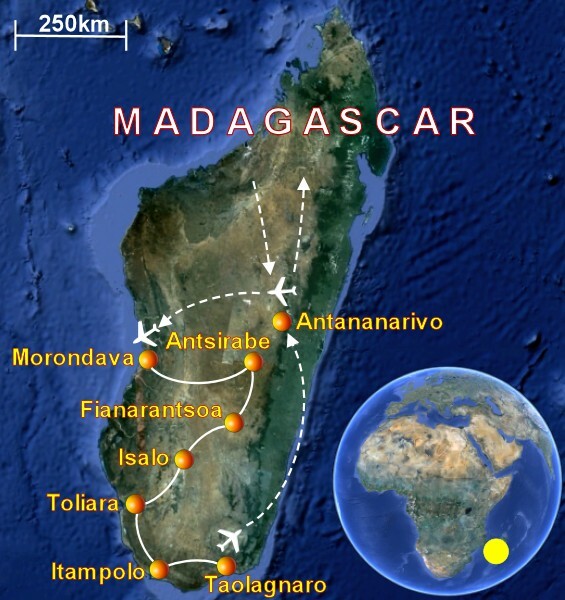 WHAT TO DO AND WHAT TO SEE DURING A TOUR TO MADAGASCAR? offers the opportunity to take long walks through canyons and bizarre geological formations, where I meet succulent plants belonging to the genus Pachypodium as well as many lemurs and reptiles. In Isalo I leave civilization and I enter in the "deep south" with its hard and dusty tracks, the kingdom of thorny forests dominated by bizarre (and rare) endemic plants belonging to the family of Didieraceae, as well as various species of baobab. This is also the realm of the tortoise Geochelone radiata and other rare species that can not be found anywhere else in the world. The trip ends with a visit to the National Park Berenty and its spiny forest full of lemurs, from where I come back to Antananarivo with a domestic flight, departing from Fort Dauphin (Taolagnaro). HOW TO BOOK A TOUR IN MADAGASCAR? This is an individual journey in Madagascar carried out by renting a 4x4 car suitable for the conditions of the slopes, with a local driver, planning the itinerary and therefore booking accommodation in advance. All the reservations were made through Jenman African Safari and I recommend to contact them, taking advantage of their expertize. The trip includes travelling by car several hours daily as well as short walks (3-4 km on average, with a maximum of 12 kilometers in Isalo) . It is likely that you will not sleep for more than 1 or 2 consecutive nights in the same accommodation. WHAT IS THE TRAVEL COMFORT AND SAFETY SITUATION IN MADAGASCAR? Apart from the most popular tourist centers (Antananarivo, Morondava, Antsirabe, Ranomafana, Isalo), which have accommodation of reasonable quality and with most comfort, the "deep south" requires a certain spirit of adaptation (electricity is available only a few hours a day and the shower is only by pouring the water with a bucket). The road that connects Morondava to Antsirabe via Isalo and Ranomafana is paved, but in the "deep south" there is only a network of very dusty and often in poor condition tracks, requiring all the skill of the driver not to get stuck somewhere where other vehicles won’t pass by for many consecutive days. In the case of individual travel in Madagascar that also includes the "deep south", it might be advisable to hire two vehicles, however, to have the opportunity to continue the journey in case one breaks down or get stuck. In any case, it is advisable, always for this part of the route, to have a satellite phone because hardly any driver will get one and the mobile network covers only a small percentage of the region. The availability of the Internet is very limited and only available in the major cities, where, however, the browsing speed (also to send a simple e-mail) is very low. For the security in Madagascar, following the crisis of 2009, there are no special warnings and the country can be considered relatively quiet, within the average of the other states of Southern Africa (it’s anyway better to relying on the experience of the driver to avoid tracks or areas where there are known problems, and to follow the common "good-sense"). WHAT IS THE BEST TIME TO TRAVEL IN MADAGASCAR? There is no best time to visit Madagascar, as each season offers different opportunities. The summer, usually very hot and humid, is from October to March and this is the best time for fans of reptiles (geckos, chameleons, turtles, snakes) because these animals are at the peak of their activity due to higher temperatures and the great abundance of food. However, the frequent and abundant rains could cause the closure of some roads or tracks and trails may be less comfortable for the strong heat and humidity. During the summer you can’t visit the "Deep South" of Madagascar, the only place in the world that houses the xerophytic plants belonging to the family of Didieraceae, because of the heat and because the tracks may be impassable due to flooded river beds. The dry season in Madagascar is from May to September, when temperatures are much cooler (sometimes it is even cold): in this period the reptiles are less active and some species are hibernating, but the sparse vegetation allows to see more easily lemurs and other wildlife. The walks become much more comfortable and this is the only time of year that allows you to visit the spiny forests found along the southern coast of Madagascar, as there are less chances of finding flooded tracks. The SA Airlink airline (partner South African Airways) has a flight linking Johannesburg to Antananarivo daily to both directions with schedule suitable to allow a connection with the flights linking Johannesburg to Europe and then to own country, in code-share with South African Airways / Lufthansa. Alternatively, Air France has a direct flight Paris - Antananarivo and vice versa, but it is available only a few times per week. Domestic flights are operated by Air Madagascar, an airline which unfortunately has a habit to constantly change the shcdules of its flights, often changing not only the time, but even the day of the week in which the flight is operated (with the aggravating circumstance that such changes may also occur shortly before your trip, without notice). Therefore, we recommend at least 1-2 nights in Antananarivo before and after flights in connection with Air Madagascar, in order to have an extra buffer in case of delays, cancellations and last-minute schedule change (alternatively, if possible, just completely skip domestic flights and do everything in 4x4). Morondava is known for its huge beach, point of departure and arrival of the local fishermen who use sailing boats typical of the region. But the main attraction of Morondava is the large population of at least 3 species of baobab, bizarre-looking tree considered sacred by the people. The Kirindy park is home to a xerophytic deciduous forest consisting of deciduous trees and shrubs, particularly resistant to drought, which in turn is home to 7 species of lemurs, several birds and reptiles, but also the rare "Madagascar Fossa" , a fearsome predator that hunts birds and mammals. Tour of the city of Antsirabe with a visit to some small family farms devoted to various sectors of the local, such as the processing of zebu horns. Continue along the roads through the countryside of Madagascar until Ambositra, capital of the woodwork. The Ranomafana National Park was established to protect a large area of rainforest that is home to many reptiles and various species of lemurs, some of which have only been discovered recently. Each year sees the presence of different animals, so you must plan your visit according to the species you would like to observe. The trip in Madagascar continues to the deep south, crossing the town of Ambalavao, known for hosting the only vineyards in the surrounding countryside of Madagascar, as well as being famous for the production of a particular type of paper made from processing the bark of a tree. Do not miss a visit to the Anja park where some families of lemurs live. The Isalo National Park covers an area geologically very interesting for the presence of coloured rock, natural pools and maze of small canyons, home to rare succulent plants (some species of Aloe and Pachypodium), as well as several reptiles and lemurs. I leave the "highway" that continues to Toliara and take the turnoff to the "deep south". From now on, for a long time, I'll never see asphalt but only dusty tracks often in poor condition, and especially I will not see any other means of transport, but the cart drawn by the zebu. I arrive at the National Park Beza, along a trail that winds through forests of real Alluaudia, a xerophytic plant that lives only in this region of Madagascar. The roads in the south of Madagascar go through real xerophytic forests of plants belonging to the family of Didieraceae, in particular, in this small region between Beza and Tsimanampetsotsa, there are many Didierea madagascariensis. The trip ends reaching Ambola, a fishing village with a huge white sandy beach. The national park is home to a large population of Tsimanampetsotsa baobab, Pachypodium and other succulent plants, but the main attraction is perhaps the endemic fish which is completely blind and without pigmentation; it can be seen very easily from the shore of a small pond contained in a small cave. The journey from Itampolo to Lavanono puts a strain on the experience of the driver, but a tour of Cap Saint Marie, the southern tip of Madagascar, with its population of turtles and rare endemic succulent plants, in addition to beautiful scenery, repays all the efforts. The small protected area of Kirindy taken away from deforestation, is home to a real forest of Alluaudia and Euphorbia, also called the thorny forest, which is the ideal home for various species of lemur, many birds, large flying foxes and some reptiles. Because of the domestic flights often unreliable and therefore the impossibility of obtaining international connections in the day, Antananarivo is a must for those trips to Madagascar that are not limited to the beaches of Nosy Be. In Antananarivo I visit the residence of the King, the Queen's Palace and I go to scenic spots for a view over the city.